Conflict is inevitable in marriage, and how to divvy up chores is one of the most common conflicts. Virtually every couple I have seen for counseling over the last twenty years has argued about the division of labor in their marriage. As the mental scorecard of who does what grow longer with each year, the couple’s friendship and good feeling is eroded. First, a few words about conflict in general. We know that not all conflict can be resolved. That’s to be expected; learning to tolerate conflict is something all people who live or work together must do. Some issues will come up many times over the course of a long-term relationship, but this is not a sign of failure . Think of managing conflict rather than resolving it. Framing disagreement this way gives you the opportunity to talk over issues and work toward compromise. Remember, couples that never fight are not necessarily happier. Anger that’s papered over, denied, or unexpressed doesn’t disappear; it tends to compound over time. In fact, anger and conflict can strengthen relationships when you express your needs in ways that will be heard (as opposed to harping, nagging, constant complaining, criticism, and negativity). For example, don’t go into a conflict discussion with guns blazing. A softened startup helps set a friendly context that will determine the way the whole thing goes. Being able to follow basic rules of good-faith engagement will lead to deeper understanding and more productive discussions. Of course, screaming, threats, sarcasm, name calling, and criticism are never okay. Disagreements can arise in several ways. Couples can have very different ideas about what “clean” means, for example. The stereotype is the slob who claims not to see the dirt paired with a hygiene-obsessed neat freak. While it’s easy to understand the role of laziness in conflict, over-vigilance can also be problematic. An over-controlling gatekeeper may set onerous rules and methods for exactly how housework gets done, what kids can eat, how much screen time they can have, and so on. Women tend more toward gatekeeping—of course, this is a generalization, and roles are fluid and changing today. But in the case of a conflict around a gatekeeping mother, a deeper understanding of the pattern might include appreciating how women often feel heavy cultural pressure to run perfect households. Stay-at-home mothers, especially, may feel that their power in the husband-wife relationship lies in setting domestic rules. But like everyone, such mothers need a break with housework and kids sometimes—and that means letting their partners do things their own ways, within reason (children aren’t neglected and chores get done). If one partner makes up all the rules, the other will feel resentful. If there are significant differences in how things are done, find ways to communicate about them and find solutions both can agree on. Stepping up on the one hand, and accepting good-enough help on the other, can go a long way toward resolving this conflict. Another common but not always acknowledged conflict is, for couples with children, agreeing on what counts as time with the kids. Mothers typically consider activities such as shuffling kids to activities, packing lunches, or coordinating after-school activities as parental involvement. But dad may think that throwing around a ball or playing a video game together counts equally well. Fun is important, but no one parent should have to shoulder all the mundane activities. As hinted above, gender plays a role in labor division, even if not deliberately. Often, gender roles established by the couple’s parents become the template of how household and parenting jobs are divided. Some couples will consciously avoid doing things the way their parents did. But certain jobs are still likely to get divided along gender lines—men take out the garbage, pick up dead animals, do the yard work, and plunge the toilet, for example. Even when both partners have jobs, women do considerably more housework. Data from the National Survey of Families and Households conducted by the University of Wisconsin shows that women who don’t work outside the home spend about 38 hours a week on housework compared to 12 hours for their husbands. Working women continue to do the bulk of the cooking and cleaning, around 28 hours a week, while husbands of working women contribute about 16 hours a week on chores. Assessing labor division is further complicated when some work is invisible. 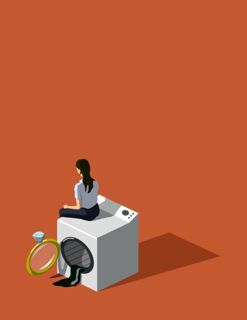 Certain time-consuming jobs routinely fall to women but don’t count as “housework,” such as planning the social calendar, play dates, childcare, and birthday parties, including buying birthday gifts and supervising thank-you note writing. This work matters: teaching good manners and assuring that children don’t get left out of the ever-shifting social hierarchy of childhood is important to their development and happiness. When this issue comes up in counseling, men will routinely tell their partners not to worry so much, but unfortunately this does just the opposite of reducing conflict. It feels and is dismissive. Even couples that have full time childcare don’t escape the division of labor struggles. Surprising to couples who do not have live-in childcare, even managing the nanny has to go on the list of who does what. No one turns over the care to their children without giving sufficient time to forming a good working relationship with the person charged with caring for them. When you think about who does what, pay attention to the little things, such as taking out the garage, cleaning up the dog poop, getting oil for the car, taking clothes to the dry cleaners—they may seem like minor errands, but they add up. The list of common household jobs below shows many things that go into running a home and managing a family. Use it to discuss who does what in your relationship. Next to each activity, put the initials of the partner who does that job. Then go through the list again and see if there are chores you’d like to restructure. Remember that things don’t have to be balance out 50/50, so long as you each agree on how to structure the tasks that need doing. If there are things that no one wants to do, consider taking turns or finding other ways to make up the difference. It’s also worthwhile to consider which chores are occasional or seasonal and which are weekly or daily tasks. Who does what in the relationship? Buying gifts for family members and housewarmings, etc. Excellent, as usual. My wife and I live by the dictum that a relationship isn’t 50/50….its 100/100…that either party has to be able to manage any and all responsibilities for which they have the training and ability. Dan, Excellent point about 100/100. I agree that trying to make everything equal and ‘fair’ is unrealistic. Thank you for that reminder. Tony, Most marriages will have some old unresolved issues after 33-years! And, cultural issues play a big role in how we look at who does what in relationship. Staying out of the kitchen can be a good thing, if your wife likes being the cook.